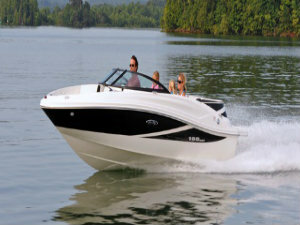 Our dealership sells several brands of new boat, including the complete line of Sea Ray and Boston Whaler. Whether you're looking for a bowrider, sundeck, cuddy cabin, yacht or another type of boat, there's a good chance one of our boats will meet what you're looking for. We also have used boats for sale, so give us a call or browse through our inventory to see what's available. Our certified Mercruiser service department and ship store makes us the most full service boat dealer in the area. We offer servicing and repair for engines, boats, and trailers.